Incognito™ Orthodontic Braces are placed behind your teeth, so no one will even know you are wearing braces – unless you want them to! These unique braces are created using state-of-the-art technology and are the only 100% customized, invisible, fixed braces system on the market today. 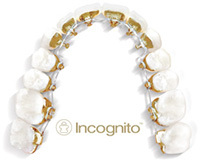 Incognito Braces can give you a beautiful smile, even while you"re wearing them.